German town in the province of Hanover. It belonged formerly to the bishopric of Hildesheim. Jews lived there as early as the fourteenth century. On July 27, 1428, Magnus, Bishop of Hildesheim, pawned the Jews of the city and bishopric, including those of Peine, to the municipal council of Hildesheim for 600 Rhenish gulden. Samson Pine, who, by his translations from the French, aided Claus Wysse and Philipp Kolin of Strasburg to continue and complete the poem of "Parzival," was perhaps a native of Peine, as Güdemann assumes ("Gesch." iii. 159, note 4). In the seventeenth century, from 1621, the Jews there were required to furnish the episcopal bailiffs six "malters" (about 108 bushels) of rye annually for the maintenance of two greyhounds. The bishops of Hildesheim, as independent sovereigns, granted letters of protection to the Jews of Peine (as in the case of Bishop Maximilian Heinrich, on Oct. 24, 1662). In the eighteenth century more than forty Jewish families were living in the city, "on the dam," and supported their own rabbi; he was subject to the rabbi of Hildesheim, whose district included the entire principality of Hildesheim. Among the rabbis of Peine were the following: Samuel b. Judah (Sanwel Ashkenazi; subsequently went to Bonn; d. 1766); Jacob Schwanfeld (went to Halberstadt; d. 1775); Möschel Elkan (called to Hildesheim in 1808; d. April 11, 1822); Meïr Preuss (lived at Peine in the middle of the nineteenth century). At the time of the Westphalian rule the community of Peine, with its forty families, was under the syndicate of Wolfenbüttel. 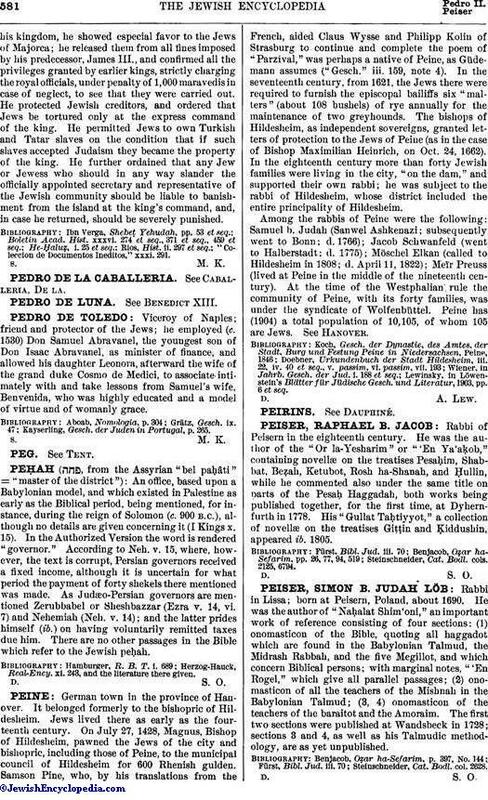 Peine has (1904) a total population of 10,105, of whom 105 are Jews. See Hanover. Lewinsky, in Löwenstein's Blätter für Jüdische Gesch. und Literatur, 1903, pp. 6 et seq.